It is regretted that it may caused inconvenience to many of our friends who regularly visit our website, which we were not in a position to provide you the constructions progress news updates on time. It is because of the hectic schedules of our Chief Administrator;Geshe Ngawang Zangpo who had participated in the programme in New Delhi; 50 years of His Hoiliness The Dalai Lama in India “A tribute Of Gratitude” from the people of Himalayans regions on the occasion of 74th Birth day of H H the 14th Dalai Lama on July 6th 2009. His presence in India has contributed and gifted immensely in the field of education, Buddhist cultures and the preservation and promotion of Buddha Dharma, promotion of strong cultural and friendly relationship amongst people of Himalayan regions for the last half a century of His Exile . The senior monks of Ngari, headed by Ven Geshe Ngawang Sangye one of our principal dharma teacher, our chief administrators and managements Geshe Ngawang Zangpo and Gen Tashi and the other senior monks held intensive deliberations and brainstorm on our future course of actions on various important Khangtsen’s issues such as fund-raising for the ongoing construction mission, management of newcomers & students’ disciplines, all-round education and character developments, new rules and overall managements of the Khangtsen itself for the further preservation of Tibetan Buddhist Cultural Heritage in particular . On the auspicious anniversary of Shakyamuni Budhha’s First Teachings or Choekor Duechen in Tibetan, which falls on 4th day of the 6th month of Tibetan Calendar, a new Disciplinarian and two Mess managements were appointed with a simple ceremony of Puja in Khangtsen’s Prayer Hall in order to have success in every spiritual and secular activities of the society. 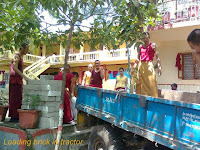 Over the weekend, the students are loading the tractor with bricks for the constructions. 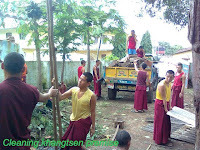 They are also cleaning up the Khangtsen’s premise and surroundings for the upcoming one and a half months summer retreat or (Yarney in Tibetan) in the monastery itself. 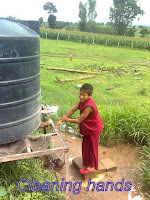 Since it is a rainy season, as rules laid down in Vinaya by Buddha Shakyamuni, monks should observe the summer retreat strictly and are not permitted to move around beyond the demarcated area. The principal idea of the observance of summer retreat is to avoid unknowingly killing insects and worms that breed in the green grass in large number…..